Meagan DeMenna: Hello and welcome to the launch of Freelancer Success Stories. Today’s topic is Visibility in the Freelance Economy. My name is Meagan DeMenna. 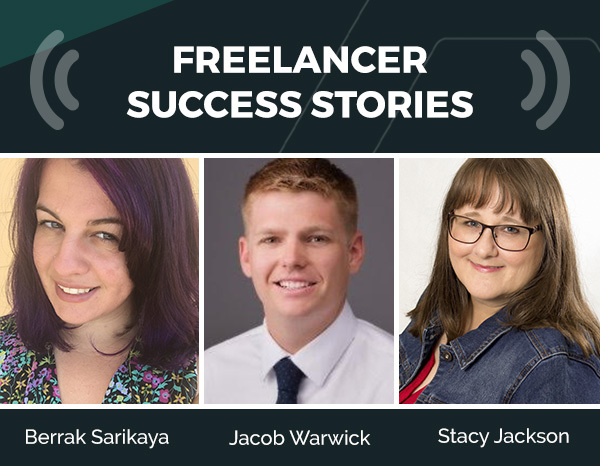 I’m the Community Manager her at ClearVoice and I’m joined today with industry experts Berrak Sarikaya of Berrak Biz (@BerrakBiz), Jacob Warwick of Think Warwick Communications (@jacobwarwick) and Stacy Jackson of Jackson Marketing Services (@Stacy_Jax). Hi guys, how are you? Stacy Jackson: Great, how are you? Meagan DeMenna: Doing great. Good to have you all here. Jacob Warwick: I’m doing well also, I’m just not used to having to talk over some people, so I’m trying to be careful here. Meagan DeMenna: I know, it’s hard with podcasts. I’ll just do a real fast introduction of the series since it is the first, it’s the launching of Freelancer Success Stories. Then we’ll just do a quick introduction after that. Meagan DeMenna: Great, thank you. At ClearVoice, we work with freelancers daily and we tend to have similar questions pop up. We thought we would address these questions through podcasts. Instead of us just answering these questions, we wanted to get industry experts, like our guests today, to answer your questions, address your concerns and they can share their personal stories, successes, failures, pain points and everything in between. We brought on Jacob, Berrak and Stacy for this first series. The questions that we’re asking today were sourced directly from the community. If we don’t answer a specific question you have on visibility in the freelance economy, feel free to shoot us a question through social, or you can reach out to one of our guests personally. Their social handles and channels will be posted with this blog post. Then keep an eye out for our next topic, which will be on pitching. That’s basically it, if we want to just go around and introduce ourselves. Let’s start with Berrak. Berrak Sarikaya: Sure. Hi everyone, I’m Berrak Sarikaya. I’m the founder of Amplify Your Biz. I started out as freelancer about eight years ago and I’ve been doing it full-time for basically that entire time and I’ve gone through the ups and downs of it. I focus on content strategy and social media strategy and copywriting for my clients. I also focus on helping out other freelancers with the content that I create. I look forward to answering your questions. Thanks for having us here. Meagan DeMenna: Awesome, thanks for joining us. Jacob, you want to go? Jacob Warwick: Sure, so let’s see, I’ve been in digital marketing for about 10 years now. I started at 17-18 years old and had a little bit of what they used to call a side hustle where we just kinda take work wherever. I started in graphic design, video editing and then moved into copywriting over these past five or six years. Been using the ClearVoice platform and writing for some of my clients through there. Then have recently started a digital marketing agency where I work with actually several contract employees and freelancers, so I’ve kinda seen it from the freelancer perspective, the project manager perspective and the agency perspective. Meagan DeMenna: Yeah and when we first set this up, you were still wholly a freelancer, so I think it’s funny that we’ve seen you through such big transitions. Jacob Warwick: The times are a changing. Meagan DeMenna: Congratulations too, that’s huge. Stacy, you want to go ahead and introduce yourself? Stacy Jackson: Sure, I’m Stacy Jackson. I founded Jackson Marketing Services in 2011 and that was the result of getting laid off when the company I worked for was acquired. I came into freelancing kind of as a second thought. I didn’t really anticipate being a freelancer or business owner, but I’ve really enjoyed it and I do content marketing, writing and editing for different companies. Meagan DeMenna: Thank you all for joining us today. I think it’s interesting to note that all three of you weren’t expecting to be freelancers and as Jacob puts it, it chose you. The lifestyle chose you. We hear the question all the time, “How do you market yourself more effectively?” So let’s start there: How do you market yourself to ensure that you have enough business every month? Jacob Warwick: Well, I guess I will start off here. I think your hesitation is perfect, because a lot of freelancers don’t know how to market themselves right off the bat. Originally for me, it started with word of mouth, talking to friends and some of the businesses that I worked with initially, just kind of saying, “Hey, do you know anyone else that needs copywriting work?” Or kinda playing that word of mouth game for a while, but then it kind of turned into more of a social media strategy and having a personal brand online. Building that over the past decade has helped me kind of develop a portfolio online that potential clients can see and determine whether they want to work with me or not. I’d be interested to see how Berrak and Stacy kick started their marketing for themselves. Berrak Sarikaya: I technically still haven’t. Honestly, I stumbled onto this and I credit Twitter. I was freelancing kinda part-time and then I was hurled into it when I was fired from my last full-time job. Stacy, I was kinda in the same boat and that was my first communications job. I was actually writing under a pen name at the time and I did not think that writing and working with content could be a career. I had no idea. It was a lot of word-of-mouth. A lot of really jumping into different conversations, so I am admittedly awful at the business level side of things and I don’t like to sell myself. On Twitter, I participate in tweet chats and I basically give my experience and knowledge out and I have my own blog. Through the different content that I put out and my website, my brand and my services and what I put out is already out in the world. It’s been a lot of work. It’s a lot of creating a foundation, really fine-tuning what I like doing and jumping into those conversations when possible and going to a lot of networking events, whether it’s conferences, in person locally or even just online. It’s changed even a lot in the last three years, so it’s definitely a lot of trial and error. Before anything else, knowing what you want to do and how to want to market yourself before you jump in to do it and create a strategy. Stacy Jackson: Yeah, I’m in the same boat with you Berrak. I hate to sell myself. I don’t know why it makes me uncomfortable, kinda like bragging I guess. You feel like, oh I’m not supposed to brag, but definitely building network relationships. When I got laid off, the reason suddenly I decided to delve into self-employment was because of the people in my network whom I reached out to because I needed a job. They didn’t have a full-time job for me, but they did have projects and they knew my reputation from my former career and just keeping in touch with people and continuously reaching out and maybe trying to think about helping versus selling. Where can you help people and just reach out, hey I noticed such and such, I can help you with blah, blah, blah. It’s made it easier for me to work on that aspect of drumming up new business, but again done a lot of the things that Jacob and Berrak mentioned, social media, trying to SEO my site. Just the different things that we all probably tell our clients to do for their websites. Meagan DeMenna: Do each of you also run the same sort of social you know, newsletter, blog. Can you touch on the assets that each one of you manages? Jacob Warwick: I actually have had a rough ride with this. Originally, I thought that you kinda needed to be everywhere on social media in order to attract the right clients, so I was an early adopter of Pinterest and Instagram and Facebook, Twitter, LinkedIn, Snapchat. Every kind of social network you can imagine. Then trying to manage each of them for an hour or two a day, which will actually drive you borderline insane and might just send your ego through the roof, just because you’re trying to pay attention to how many people are liking and commenting on what you’re doing. Originally I started with that and then I fine tuned where my audience was specifically, which has been Facebook, LinkedIn and Twitter only. I use each in a unique way. I don’t necessarily get any business from my newsletter. I don’t get too much business from my website, although I do like to have it there as a resource. Then I used my three networks, Twitter for research, LinkedIn to understand the business need a bit more and then Facebook to develop that personal relationship. Berrak Sarikaya: Yeah, I love Twitter so much, I can’t even. It’s my favorite platform and it’s given me so many opportunities. I have been struggling with this, because I have focused so much on my client work for the past five years that my own blog and newsletter has kind of fallen by the wayside, because I do it for 30, 40 hours a week for my clients. Focus on their content, focus on their content marketing and mine has kind of struggled, so I’m essentially starting from scratch with my newsletter. One thing I have done, even when I’ve been super busy with client work, has been definitely keep Twitter and Facebook and LinkedIn have been the networks that I’ve focusing a lot on and I love LinkedIn right now because of the changes that they’ve done to their platform. It makes engaging with other people and following thought leaders and jumping into conversations a lot easier than it was, you know, six, seven years ago. Those are the assets. I’m working on, developing a newsletter, but honestly, I, like Jacob and Stacy have said, I’ve learned so much more out of just being on Twitter and Facebook and in conversations and participating in discussions. Especially where there are newcomers, like other freelancers who are just starting out. Being able to give them advice has helped me get my name out there more, but also remind me of what one of my target audience’s needs are and jumping into those conversations has been more beneficial for me than crafting a perfect newsletter that goes out every day or every week, at least at this point in my career. Stacy Jackson: Yeah, I can really relate to what you’re talking about Berrak, about time for your own business. I have not written a blog post for my blog in forever. Thank goodness my sister works with me and she can take some of that load on, but it’s very difficult. I mean I don’t want to complain, I’m glad to have work, but it is hard to keep yourself going when you have to focus on client work. I do participate on Twitter, LinkedIn. I haven’t used Facebook so much for business, but I am seeing more people get involved with that and I’m experimenting with ways that I can use that for business, but definitely Twitter. My very first big client I ever got, I got through an interaction on Twitter, because I, believe it or not, tweeted something stupid about guacamole and it has nothing to do with anything with either of our businesses, but the guy just liked my personality and looked at my website and then we got involved and I still have that client today. Just even practicing being authentic and not always business oriented even, has been helpful on social media. Meagan DeMenna: Great, so what I’m hearing is this common thread that the interactions you have through networking on social and in real life actually are proving to be more effective than a website. That’s not to say that you shouldn’t have a website, but to constantly be in front of your audience, the right audience and the right social channel and figuring out where your target audience is and not being spread thin on all social channels. Is that right? Meagan DeMenna: So what do you do to maintain a healthy looking website, so that when people do decide to move a little further down the journey and look at your website, what do you need to have there? Jacob Warwick: For me, I think it’s important to set up a strong foundation. Some past work that you’ve done, like a portfolio, something I actually use ClearVoice for. Then having some information about you, ways to connect and reach out to you, things like that. You don’t necessarily need to be too concerned with finding the perfect domain name or building a brand and a logo and this right off the bat. I think it’s important to set that foundation and that general information out first, then update it periodically as your needs change or if you decide that maybe only want to work in B2B tech, or you only want to write for health and fitness. You can kinda change your website accordingly. Berrak Sarikaya: I rebranded my name, business name, but my website has either been … Back then about.me was big. I had a page on about.me with my name. I own my full name as a domain, but that’s not my landing page, that redirects to somewhere else. What Jacob is saying I agree with. I was super concerned about making it perfect or not even having a website until I could afford to hire a web developer, but I actually had my first writing portfolio on Pinterest, before ClearVoice and other platforms that were available. I would put up my links as a writing portfolio on Pinterest board and that was kinda fun and, it was kinda quirky, so people thought that was interesting. I also didn’t have pricing on my website up until recently, or services. You want to make sure there’s an easy way to contact you. There’s a picture of you somewhere. Definitely if you have a blog, it goes to the blog. If you have other writing samples or if you have testimonials, pop them in somewhere on your website. It doesn’t have to be complicated. Up until recently, my website was one page. It had at the top, my little bio and then it had links to my social. It had links to my blog and then it had a section on the work that I do and who I work with. It was just one page and you could pop in there and see and then reach out to me through the contact form. You can keep it as simple as possible, as long as you’re getting the essentials out, which is: Who are you? What do you do? What kind of work do you do? How can people reach you? Which is sometimes the biggest thing that people forget to include on their website, which it’s like the easiest thing to overlook, but the most important thing you need to have on there. Meagan DeMenna: Sure. Stacy do you have anything to add on that? Stacy Jackson: I guess, not a lot to add to that. Like I mentioned on our Facebook Live interview, you might be able to lean on a friend or a contact that could help you if you trade some work with them. I’ve had a contact who’s helped me set up some things in WordPress that I needed help with on my website. If you’re not willing or don’t want to spend the time to learn something, just tap someone in your network and see what you can work out with them. Meagan DeMenna: How important is SEO in the beginning stages of being a freelance writer? It sounds to me it’s more networking. Jacob Warwick: Yeah, so coming from having about 10 years of SEO experience, SEO is important a little bit later on in my opinion. Obviously, if you know it and can nail it right off the bat, it is extremely valuable, but it’s not something that you necessarily need to concentrate on as far as marketing yourself. Knowing the basics of SEO, the technical aspects and just the general formatting and how to do keyword research and things like that will come in handy for your client work. If you could pick up a skill, SEO is gonna help you get paid more if you can market it appropriately to the right clients. Building that knowledge base is important, particularly in the early part of your career, to help you differentiate the type of copywriter that you can be. Meagan DeMenna: Great. Berrak or Stacy, do you have anything to add on that? Berrak Sarikaya: Nope. I didn’t do a ton of SEO when I first started out. Stacy Jackson: When I first started out, I did work a lot on SEO and that was really where I was trying to focus most of my time, but we’re all in such a competitive niche, it’s really tough to get your site to rank for certain keywords nationally, so I did a little bit of local SEO for local businesses. I think Jacob’s right, it’s really more about knowing it for your client projects, but really keep working that network to get the jobs that you want. Jacob Warwick: Yeah, I mean you’re on an uphill battle if you’re trying to rank for content marketing or content strategy or copywriting. First of all, Content Marketing Institute owns the entire space in terms of, I mean you’re not gonna compete with them unless you can put up the type of content that they’re doing. You might get a few long-tail wins here and there on SEO stuff, but there are certain, as Stacy mentioned local SEO, there are a lot of advantages. If you’re working primarily with local businesses, then for example you might have the, like for me, Incline Village copywriter. I can own that. I can be the number one copywriter in the Lake Tahoe area. That is definitely less competitive than a more general search. Stacy Jackson: Right, I mean yeah we have a hard time ranking for things as a company, so to be in that space as a freelancer, it seems to spend more time creating those networking connections or advertising locally, that seems to be a bigger pay-off. Jacob Warwick: Yeah and again, that depends on what your business model is. If you’re a freelancer working nationally, then I wouldn’t concentrate too heavily on it. Of course, you could pick up clients locally if you live in the San Francisco area. That’s gonna be more competitive than if you live in a smaller demographic area. If you again do local business work with any I guess, any local business, hair stylists, salons, the local burger joint, you can help them rank and copy if that’s your business model. I think that the freelancers that are on right now, primarily work on more of a national level, where I’m working with tech companies that are trying to rank nationally, or even globally for terms, so definitely a unique challenge to overcome at that level. Berrak Sarikaya: I will jump on and say one thing. I happen to have the same name as a freaking actress in Turkey and I was like, okay I need to make sure that people find me when they google my name, it’s stuff that I write and my things are coming up, which is where having a blog and guest posting and being active on different networks can come into play. It’s not only focusing super heavy on SEO on your website, but having that presence. When people are searching for your name, the first page of the Google results, any search engine results are linking to what you want people to see, versus something that can be older and not relevant. Generating new content and new presence under your name is definitely one important SEO point that you want to keep in mind. Meagan DeMenna: Yeah, that’s a great piece of advice. I actually worked with someone recently and he ran into the same issue. He had to go by his full name instead of the name he’d been using for years. He just had to switch over, instead of Mike it was Michael at that point. How do talent networks and freelance marketplaces fit into your visibility? Are they … Just dive into where they fall in the grand scheme of things. Jacob Warwick: I think they’re more important earlier in your career before you’ve built that brand recognition to differentiate yourself and pick a niche that you’d like to write about. For example, like ClearVoice, a talent network like that. It makes sense to get visible in as many of those as possible, and if you can get accepted into these other places, you’ll have more writing opportunities and see how they work, particularly at the lower rates. Berrak Sarikaya: I think that we’re focusing on writing, but a lot of different platforms for freelancers, because freelance work is varied. It’s good to be on and that also will help with the name thing that I mentioned if you’re on different networks. If you are going to be on different networks like that though, make sure that your profile is complete. I honestly, even after being established, I make sure to keep all of my profiles updated, because you never know what kind of clients that you can get from there, even if you’re established and you’re well known and people recognize you, that doesn’t necessarily mean that you shouldn’t update or you should let go of the platforms that you’re on. I just had a blog post go live today on ClearVoice actually, so after we record this podcast, I’m gonna go on and update my ClearVoice profile and my website and different platforms that I’m on with that link so that it’s fresh content. It’s important to know the nuances of every platform that you’re on and definitely this is where networking with other freelancers come into play, because people have different experiences and different tips and tricks that can help you be better in addition to read guides that the platform, like you know, you guys are recording this podcast right now, which is awesome that they’re providing the people who are on there. It’s definitely whether you’re just starting out or you’re established, if you’re on the networks, then make sure that you’re not letting them go by the wayside. Stacy Jackson: Yeah, that’s a great point. If you don’t go on there and keep that updated, then people may make an assumption that you’re no longer freelancing. I really agree with that, that’s very important to keep. Meagan DeMenna: Something you just mentioned, Berrak. You have a post going live with us today, thank you. How important is it to get guest posts going? In way of ordering this out, you need visibility on social, you need a website and then guest posts – where does that fall? It’s good with visibility. It’ll also help you practice writing for different audiences because every website that you might write for might have a different editorial process, so it helps you, especially if you’re new or if you’re a new freelancer and you haven’t worked with a lot of different clients and different websites, it’ll give you practice for engaging with different editors, different processes, communication styles, and when it’s not a client and it’s a guest post, you can feel a little bit more comfortable and it’s almost like getting practice in for interviewing, you know pitching for guest posts. Jacob Warwick: I definitely agree with what Berrak’s saying on that. I was pretty fortunate in that my first kind of guest posting experience was with Adweek and then Entrepreneur, which a lot of writers strive for if as we’re talking about freelance writers specifically. Getting content on links on those sites is really important for some, however I honestly noticed more traction in the niche blogs like Writing for Content Marketing Institute or ones that are more focused rather than general. For example and this might be controversial, but I wrote an article for Forbes and literally saw nothing from it other than I can use the Forbes logo now. It really depends on the audience that you’re trying to build and don’t underestimate the value of a particular guest post based on the brand that you’re writing for alone. I think a lot of people tend to over-value Entrepreneur posts or Fortune posts or The Next Web, places like that. They do get a lot of traction, but they’re not necessarily reaching the right audience for you specifically. That’s definitely something you should keep in mind. Stacy Jackson: I actually have a question for you guys based on talking about guest posts because the guest posts you write, do you try to draw those people back to your LinkedIn profile, or does that change anything you would say about having a website? Even with social media, a lot of people talk about digital sharecropping, or what if this medium goes away? Or that blog goes belly up? Does that change or enhance what you would do with your website? Jacob Warwick: Yeah, not particularly for me. I guess the most I’ve done is on Entrepreneur, where I’m sharing insights about what it’s like to be an entrepreneur, but that’s kind of relevant for that audience. Most of the time I’m really just concentrated on helping the people that would be reading that content. Then I’m driving more traffic through the fact that I have a byline there, rather than that authorship at the bottom that says, Jacob Warwick is an agency owner and this is his website. I get more traffic through that for the actual website, than say the links throughout the post. You have to actually set up those links, you’re not just saying, “Oh by the way, Jacob works here. Go click on this link and automatically become a client of mine.” It’s much more … You have to be much more tactful. Your suggestions are taken seriously if you do it in an appropriately manner. I don’t directly promote myself in any way, which may be one of the reasons why I don’t get a lot of traffic from it. However, it doesn’t necessarily need to drive your interests. I know a lot of writers that are just obsessed with let’s get our article on Forbes, I mean that’s the holy grail of your writing career and that’s absolutely not the case. It’s more important to just concentrate on the audience that you’re helping, no matter who is reading it. You’d be surprised at the type of people you get on platforms or publications that aren’t Forbes, or they’re not these big well touted publications. Berrak Sarikaya: Stacy, just to clarify, were you asking about linking within the post to your website, or where you direct people in your byline? Stacy Jackson: In your byline. Berrak Sarikaya: I personally go first on my website and I always have a Twitter handle because I’m most active on Twitter, even if people don’t look on my website, I want them to be on Twitter. If I was active on another platform, that’s where it would go. I would recommend definitely having, this is where having a website becomes a long-term investment, because if it’s an evergreen content that you’re guest posting, then people will link to it, even if you’re not active on that platform anymore. I have both my website and my Twitter. If I only have my Twitter on there and suddenly I wasn’t active on it, then it wouldn’t be a relevant link, but this is also where the SEO with your name comes up if people can’t click over and if they do a search for your name, then they can find the most active you are at the time that they see that post and want to reach out to you. Considering the long-term implications, you definitely want to, even if it’s to your website. Like I said, I bought my full name as a domain and at one point I had it re-directed to the about.me site, now I have it directed to the website that I use. Even if you just have a domain and you haven’t created your website yet, you can have it direct to your LinkedIn, you can have it direct to wherever … Just having that domain somewhere that’s re-directing to whatever it is you’re most active asset. That’s gonna be a long-term investment even if you don’t have the website updated. I think that’s where the bio and everything that we talked about comes into play, that’s where it contributes when you’re getting links in your bylines. Stacy Jackson: Yeah, when I think about social media, I think I’m probably the oldest person on this podcast, but I actually had a Myspace account and now that’s gone, so you know just picking, not just focusing only on social and making sure you have that website there, I think that’s important. I might change my tune a little bit on the importance of a website. When I think about how it lives on, or that connection to other things that I might write or leave around the web. I’m actually working on a blog post about saving your work, especially as a writer, because everything is forever on the internet, until it’s not. I built an entire community for Google and wrote over 2,000 pieces of content for it and then it no longer … They scrapped it. It’s no longer online, so 2 years of my work is gone. You also definitely want to save if you’re published somewhere, take a screenshot, pdf it, whatever it is that you want to save long-term. Make sure that you’re backing those up, because you can also have a client or a website that you’re guest posting on and two years down the line that domain can be owned by somebody else and your content is no longer there and you need to make sure you’re updating your links and profiles on networks like ClearVoice if you have links to your work online. Maintenance and due diligence is important, because you think everything is online forever until it’s not and you’re just getting a 404 page and going, oh no. Jacob Warwick: You speak from experience. Berrak Sarikaya: I do. It still hurts. It really hurts. Meagan DeMenna: Here’s a question that might make you guys a little uncomfortable, but it’s something that we do hear, a lot. Are you ever concerned that you won’t have enough work to support your lifestyle? Jacob Warwick: I think it scares every single freelancer, which is why a lot of people don’t commit to doing it. Meagan DeMenna: Right. Can you, I mean if you’re comfortable sharing a story, a personal story where you had to really look hard at choosing, I know Stacy for you this may or may not be when you were let go of your job, that was definitely a moment where you had to choose, okay do I need to start a freelance lifestyle, or do I go and find a new job? Can you guys share stories where there’s been forks in the road where you’ve had to really confront this question? Berrak Sarikaya: I have actually done this often. I’ve actually been lucky that way. I’ve taken full-time contracts with clients, so it’s technically a full-time job, but I was still a freelancer. I face this all the time. I actually have had to take three month projects full-time in office to kind of get that cash flow until my next freelance project. It happens more often than most people think and I personally and this is where you have to find your comfort level. I just gave up a six-figure full-time contract because I want to focus on my freelance business, but this is my comfort level. There are some people who will go and take a full-time job because they think freelancing is not for them and that’s totally fine. This is what a lot of people don’t say. Not everyone has to be a freelancer. If chose it, you’re not a failure as a freelancer if you have to go take a full-time job for a year while you’re repositioning yourself or things come up in life where you have to support yourself that way, because freelancing honestly is an ongoing thing. You just have to pick your comfort level with what works for you and sometimes that means taking a full-time job for a bit and re-evaluating things and repositioning and coming back. You’re not necessarily your own business owner so to speak, but you can take it as far and stretch it with your comfort level. I’ve had this battle off and on for at least half a decade where I was struggling and then took side work and was okay. Then some months were, you’re living really lavishly and then other months are total famine. I’ve kind of gotten used to living more minimalistically and saving money in the good times to make it through the rough times, if that happens to you, which I would almost guarantee that it will sooner or later. This is how the agency itself was actually built. I got to a point where I was receiving a lot of interest and kind of turning down jobs that weren’t perfectly aligned for what I wanted to do, but they were really strong for other freelancers or other entrepreneurs that I knew, so we kind of decided to grow an agency out of that to make sure that in the famine times, everyone was still taking care of, because we were able to diversify the work across different people. I also found that when you’re a freelancer, you can only scale as, or make as much money as you’re physically and mentally capable of doing. For example, if you are completely booked and writing 30 articles a month, one every single day, that’s probably your limit. I mean, first of all you’re gonna go crazy because that’s a lot of writing, but that’s your limit, so the only way you can either make more money or increase your business is to increase your rates, which might tax you out of your market, or to bring other people on board and actually launch a full business. Stacy Jackson: Yeah definitely. I can relate to what you’re saying about becoming more minimalistic. When I had a full-time job, I wasn’t crazy, but I spent money a little more crazily than I do now. Now I am squirreling away my money for a rainy day in case that rainy day comes, knock on wood it doesn’t. When you get laid off, I went on job interviews, but nothing was happening, so just take the risk and do the freelance projects and go for it if that’s what you feel comfortable with, otherwise just get that employment check and try and find a job, but that definitely wasn’t for me. I guess I kinda doubled down, because I needed insurance. I’m a 12-year cancer survivor, so thank God for Obamacare and who knows, I’m not trying to get political, but whatever’s gonna happen happens, but really things that can help freelancers pursue their dreams or build a bigger business like Jacob’s doing and help employ other people, I think that it’s just really great when those opportunities present themselves. Just very appreciative to have the opportunity to do these kind of things and I try to take care to make the sacrifices so that I can do it and enjoy my life as a freelancer. Jacob Warwick: Yeah, I think Stacy brings up a good point. First of all, I’m very pleased that you made it 12 years through cancer. I didn’t know that about you and that just makes me all the more happy for you. I’m already a big Stacy ambassador, but now I’m even more so. Health insurance in the United States particularly, not to get political again, just it is a detriment for freelancers because one of your selling points to an employee, and this is something I’ve used, is that look, you can hire me as a freelancer and not have to pay me benefits and deal with the HR stuff and the 401(k) matching. You’re gonna save a lot of money and get a quality product. The employer doesn’t pay the down time or, they literally just pay for work, which is a big selling point in the freelance business. However, I do need to save your money in case anything happens, or kind of go through a private insurance broker, something like that. I haven’t figured that out. In fact, I have a cavity that I’ve had for like three months. I have the money to fix it, but I don’t have insurance and it terrifies me and it’s just like this mental roadblock that you kinda like, this makes freelancing sound miserable, I promise it’s not. There are these mental roadblocks that you do have to get through and a lot of it is, what am I gonna do about insurance? How am I gonna take care of my children? You do have the autonomy and the freedom to go to the dentist, but can you afford it? Berrak Sarikaya: I will say one thing since you guys brought up health insurance and everything. There is a freelancer’s union that actually you can get health insurance through. They help you find lawyers if you have legal issues with clients. I’m a big advocate of freelancers union and definitely encourage all freelancers to join. It’s free to join. They have great resources for everyone, including where to find health insurance or different health insurance options that are not necessarily through a private broker. There are resources out there, like you guys said, it’s still a roadblock and it’s still scary not to have that security at all times, the way you do a full-time job, but definitely look for those resources that are out there in addition to the networks that you’re creating for yourself. Meagan DeMenna: That’s a great tip, thank you. Something that I’m also hearing and we sort of touched on this a little bit in the Facebook Live series, a freelancer has this notion around it, but it’s like a lone wolf kind of role. The more that we talk, the more we’re realizing that it’s really a group effort. You need to network, you need to tap your contacts, you need to stay very social and active. You need to reach out to people for help all the time. To really attach this go it alone persona behind it, you have to have the confidence to go alone, but you also need to have the confidence to reach out to your networks. Berrak Sarikaya: Yeah, I am notoriously bad about asking for help. You need to have those relationships and maintain them and don’t only reach out when you need help, but when you do need help and you say “Hey by the way, in case you hear of anything, I am looking for client work. This is the projects that I’m working on.” Then people will keep you in mind and you don’t know … Everybody has different networks. Sometimes your networks overlap, other times you might have a friend that has a completely separate network from you that they may see something that you’re never gonna see unless they know that you’re looking for help. It’s important. It’s really hard, but as long as you’re doing it in a way that’s true to you and your relationships, then it will come more naturally. People don’t know what’s going on in your life, because it is, as much as you can network, it is a solo. At the end of the day, you are in charge of your work and you’re in charge of your career and unless you’re putting it out there, people don’t know what’s going on in your life. It’s really important to cultivate and nurture those relationships that you have. Stacy Jackson: Yeah and I’m leaning toward introversion I would say. I like to talk and I’ll get up and give a presentation if I need to, but I’m not one to just go open up and tell everybody what’s going on. Meagan DeMenna: Great, well yeah confidence plays a big role in that I think and I think that really allowing yourself to open up and be vulnerable, it’s just gonna be helpful in any circumstance you’re in really. Just to know when to ask help and knowing when to be confident and just not advertising yourself, it’s funny, I think all three of you said that you have a hard time promoting yourself, but how else is anyone gonna know that you’re out there? We’re running out of time, thank you guys so much for being here. The last question that I’ll ask is just kinda generic. If you have any other tips to draw awareness to your freelancer lifestyle, what kind of tips would you leave our audience? Jacob Warwick: Well, I guess I’m on the stop first again. Essentially we’ve gone over just about everything. I could echo about the power of social media and staying top of mind and then being transparent about what you do. For example, when Berrak or Stacy comments on something that literally has absolutely nothing to do with writing or work or business, I associate their little picture popping up, like Stacy’s picture and Stacy’s says, “Oh wow. It’s nice that you and your girlfriend are having a good time in Tahoe.” I think, “Oh, that’s Stacy. My marketing and copywriting friend.” It’s just like this little tick on the top of my mind, it’s like I like her and I like what she does. When Berrak posts, I think the same thing, or when Meagan posts. You know, I associate that little chat bubble on Facebook with what that person does if they’re vocal enough about it, then I always like, my mind kinda wanders and that’s where these serendipitous moments come, like, “Oh, I have an actual job that I think Stacy would be good at, maybe I’ll make that connection.” That’s kinda where social media I’ve seen has been the most powerful and it’s not necessarily selling yourself, it’s just being a good human being and trying to provide value. There’s really no way to explain how to be a good person, but that’s what that social media does for you. Seeing the little chat bubble is top of mind all the time. Berrak has never been like, “Jacob, tell me about all your writing opportunities and give them to me.” You know, it’s just like, “Hey Jacob, how are you doing? This is what I’m working on, what are you working on?” Kind of engaging with people on that level as often as you can, has really helped me amplify my business. It’s also helped me provide more business opportunities for those around me. Berrak Sarikaya: Yeah and way to use my tag line Jacob, thank you. I think that one thing and oh my God, this is, we haven’t talked about this and this is something that killed me and still I struggle with. The great thing about social media is there’s a lot of resources, there are a lot of other people doing what you’re doing, that you can kind of have a community and you’re not alone, but at the same time you go, I’m not doing enough or you look at someone’s blog post and they’re putting out three blogs a day or they’re … You are the only person that knows your limits. You are the only person that knows what you’re capable of, what you’ll want to work on. Please, please, please remember that you are awesome. You are out here, no matter where you are in your journey, you’re doing it. The freelancing thing, working for yourself, running a business, it’s hard, but you’re taking that step every day and people are going to be on different parts of their journey at every point and every turn and that’s okay, so don’t forget that. Stacy Jackson: I think that’s great too. I’ve definitely gotten mixed up in things that later I was cursing myself saying, “Why did I take this project?” That’s so important. The only other things I would add, is that it kinda goes along with what Jacob was saying, to be a good person. Just really listen to what people are saying, even in off-hand conversations. You might find little ways to make your client’s day. One of the customers I had was a sales vice-president. He went to a conference. He said, “All these millennials have these cool socks and I’m in my old man black socks.” I went out and bought him some crazy patterned socks and he just thought that was the greatest thing and he still talks about it. Just being a nice person and listen for those little opportunities to make somebody’s day can go a long way to help you maintain great relationships with people. Meagan DeMenna: Yeah, what I think is great too about choosing the work that is a good fit for you. That is why you have chosen the freelance lifestyle, is that you could actually pick and choose what is right for you, so to really be true to that and like what Berrak was saying, not compare yourself to other people. Stacy, you have mastered making your customers feel golden, so we all can learn something from you for them from that. I think that is it … We’re out of time right there and I just can’t thank you guys enough for doing this. It’s a huge help for freelancers like you. Even starting out or further along in their career, I think there’s lots to be learned from the three of you. Thank you for joining us today and again, if anyone listening has any further questions, feel free to reach out directly to our guests. Their information will be posted with this podcast, or you can reach out to ClearVoice directly too. Thank you! Meagan DeMenna is the community manager. After studying at Cambridge, she began her career writing and editing for four international magazines. Now you can catch her moderating webinars, podcasts and Facebook Live. She's a wife, mother, British lit. nerd and has a serious katsaridaphobia.